One of the harder things about GNU Radio on a new system is building the dependencies. That was a large part of my task when getting GNU Radio for Android working. All of the required dependencies needed to build rebuilt using the Android toolchain, which meant that for each dependency, I had to figure out how to set up and call the NDK properly. That was hard, and good thing that there were quite a few hints on the Internet for various programs like Boost and LibUSB. For a while now, I've had information on how to build all of the dependencies for Android on our Android support page. This includes a page dedicated to building the basic libraries and dependencies as well as a page discussing how to build VOLK, GNU Radio, GRAnd, and gr-osomosdr. It seemed like very few people could follow this through and successfully rebuild all of these packages themselves. And that's fair because I had only ever done this on my machines which are both running the same version of Ubuntu Linux (15.10) and everything else. It's hard to say how any deviations from these versions might affect things. So to help with this issue, I just published two new tools to help people get started. The first tool, which should be the go-to for anyone wanting to get up and running immediately, is a tarball of all of the pre-built dependencies as well as all of the GNU Radio support packages. You just download this, untar/uncompress it (into /opt/grandroid, generally, since that's where I tell everyone to look for this stuff), and now you're ready to start building Android apps and linking to GNU Radio. Bam. Done. The GNU Radio team also has a GPG key for signing, so you can get the public key, download the signature for the tarball and verify your download. For versioned packages, that version is given. For the other packages, these are generally projects that we had to hack to get to work under Android, so these are the git refs for my android branches of these projects. Some people are (justifiably) paranoid about taking pre-built binaries, even if they are signed. To help them, I've also published the script that I used to build the tarball of binaries. This basically takes the instructions that I made on the wiki pages and puts it into a much better package and slightly more robust way of building things yourself. It creates the directory $PREFIX, assigns it over to the user that called this script, and then uses the -K to invalidate the sudo credentials so it won't be able to do anything else as the superuser after this. The script is only tested on Ubuntu 15.10 (64-bit). And also VOLK and gr-osmosdr separately. The GRAnd package provides audio sources and sinks for use under Android. The one final GNU Radio component that I feel should be added here is gr-fec. However, right now, that requires GSL, which we have not yet built for Android. I feel that I have accomplished a great deal of what I was hoping to when I took over this role. Part of my job (and much of the fun) was being hands-on with the code almost daily. But there's a lot more to do in GNU Radio, and it is time for a new vision to move it forward to where we see it going next. While I was thinking about this role change, the opportunity arose for me to become a DARPA program manager, which is one of the most exciting opportunities I can imagine. I will still be working on radio, communications, and, of course, software radio, and I still hope to support the project and continue working with the community we have in whatever ways that I can. But this new position gives me an opportunity to pursue engineering, science, technology, and research in areas and ways that I haven't been able to do in my current role. I am pleased to announce our new leadership team, who are already very familiar to many of you. Ben Hilburn will be taking over as Project Lead while Johnathan Corgan will become the Chief Architect in charge of the codebase. They have already been doing a great job of building up their team structure and their vision for the next stages of this project, which is exactly what we need to grow and move the project forward. The transition is already happening, and we can all consider Ben and Johnathan to have taken up their roles today. I will still be actively involved in GNU Radio over the next couple of months until I start my new position at the end of May. You'll be hearing more details from them soon. But I hope that everyone knows how proud I am of this project and what we're doing here as well as my confidence in Ben, Johnathan, and what is coming next. We're back now from our Berlin Hackfest and FOSDEM. We had a great time and got a ton done. I tried to keep track of our work and progress at the Hackfest, so take a look at the wiki page for details on that. Basically, we all got a lot accomplished that improves the code base of GNU Radio as well as a handful of other side projects. One important item for everyone to keep in mind is that we are once again pursuing GSoC as a mentor organization. We are working on our list of GNU Radio projects for this summer. And thanks again to c-base for hosting us! We went straight from the Berlin hackfest to FOSDEM. I spoke on the hardware main track, and we had a full schedule and packed room on Sunday for the SDR Dev Room. They have the video for my talk posted already, though sadly it missed the first 15 minutes and there is a problem with how the slides were captured. We're also waiting for the videos from Sunday's dev room to get posted, hopefully with no problems. Oh, and I have posted my slides and all of the GRC flowgraphs I created for my talk here. After that is FOSDEM! I'm really pleased to be able to speak in the main track on Saturday, and for the third year in a row we have a packed schedule for Sunday's SDR Dev Room. GRCon15 finished up a few weeks ago, and I've just now found time to voice some of my thoughts on it. First, immediately after GRCon happened, I went to Paris for the SRIF workshop, which was great and fun and another successful workshop on software radio. I immediately flew from Paris to St. Louis for the DARPA Wait What? conference where I was a panelist along with Matt Ettus and Elad Anon. Great conference, a total blast, and I think we had a really good discussion about spectrum and wireless technology. So that's been taking up some of my time. Now, GRCon15. I really couldn't have been more pleased with how it turned out. The speakers were fantastic. The attendees were fantastic. The venue, location, and food were all fantastic. Hell, even the weather was fantastic. And another huge thanks to our sponsors and organizers! Really, I don't know what more to say about it. I'm sorry if you missed it this year. I think everyone (or most everyone, at least) got something out of it. It was fun and full of information about capabilities within GNU Radio and cool projects happening around GNU Radio. I hope, though also expect, that next year's will be even better. A final couple of thoughts. A friend of mine came by just for one day to talk shop, but his reaction was interesting. He asked me, "I don't understand, why is everyone paying attention?" To which I responded, "no one comes to GRCon for tenure. They come because they are interested in it and it helps them do their jobs better." But it makes for a great environment for talks and discussions. And speaking of jobs, it also amazed me that every company that came is hiring. We can't produce enough talent in this field fast enough. Which is absolutely fantastic! We're almost done with the agenda for GRCon15; just a few more titles to fill out and some swapping around of the lineup. But looking at it, I'm excited about the amazing set of speakers and talks we've been able to put together this year. Our New Users Day will showcase program managers from both DARPA and NSF to provide their visions of science and technology with software radio and GNU Radio. After that, we have some of our top contributors talking about various in-depth technical aspects of software radio and how to use GNU Radio. Come Tuesday, we'll start with the main conference. Leading off with our keynote, the thought-provoking "godfather" of SDR Joe Mitola will likely start us off with some interesting ideas. We've then split the talks into two general groups: Tutorials and Apps & Research. In the tutorials, we will discuss the various aspects of GNU Radio itself. The apps & research talks will involve either the way people are using GNU Radio or exploring future ideas in software radio that we're working on. This year's, we're giving our big sponsors a chance to address the entire audience. Each day, we'll hear from one sponsors. We'll start off Tuesday with Ettus Research, Wednesday we'll have DRS, and Thursday ADI. Friday is our free-for-all day, the Hackfest. We're compiling a list of projects and issues that we'd like to tackle at this hackfest. While everyone is welcome to select their own project or projects to work on, we want to provide some concept of what specific issues the project could really benefit from for those just getting into GNU Radio and our community. We'll have that list of ideas up soon. GRCon is the time when all of our Working Groups get a chance to get together and discuss their future plans. These sessions are open to all, and it's a great way to find the right people to talk to about ideas in a particular area and get involved with the project. The WG meetings this year will be parallel sessions to the main talks in the afternoons, so you can chose to attend the talks or a working group that you're involved with or has caught your attention. And finally, RFNoC from Ettus Research is quickly becoming an important part of our work in software radio and GNU Radio. We're happy that Ettus Research is providing a tutorial at GRCon15 on Wednesday for how to use and develop RFNoC blocks. Though this is free, there are limited numbers of equipment provided, and access has already sold out. As the fifth GRCon, we've seen rapid growth year over year. What started with a few dozen people stuffed into a room at UPenn has grown to hundreds of people coming to talk and learn about GNU Radio. As you can seen from the speaker lineup and talks we've prepared, while we're still centered around GNU Radio, there's a lot more going on in wireless around the project that we're tapping in to here. There's so much growth and opportunities in radio technology, science, and education. We'll be hearing and talking a lot of these at GRCon15 and in the next year to come. At least. With our continuing roll-out of support and features for GNU Radio on Android, we are looking to handle all command-and-control between the app and the flowgraph through ControlPort. While I've had the ControlPort server side working on GNU Radio apps for a while, we didn't have the mechanism in place for client-side ControlPort apps, which will be necessary for getting and setting parameters in the radio. I've now added two new projects to help us with this. The first project is GrControlPort -- this is an Android library (not an application) that is meant to provide a simple abstraction layer for using ControlPort in Java. This is very similar to our Python-based RPCConnection class that we use to make getting and setting knobs easier in that language. You use this library to make the connection to the ControlPort app and then use the returned object to get and set the knobs of the radio. There's an abstracted class to make the user code agnostic to the backend service, like Thrift. The README file explains more about how to use this, and it includes a simple Java class that shows the basic modes of getting and setting knobs of a flowgraph. I have been slowly pushing out information here and there on my work on Android. I've been able to show it off at various conferences and workshops that I've attended over the past few months. It gets a lot of very positive feedback, and we know there are many, many exciting things we as a community of developers and wireless experts can do with this kind of a system. It's time to start really pushing this project. I spent so much time getting things to work under the hood that I've completely lost track of any of the cool applications that I wanted to work on with it! But the more people that get access to this and know how to work with it, the more interesting the application space and possibilities will become. Because of that, I had been waiting for two things to finish before writing this post. 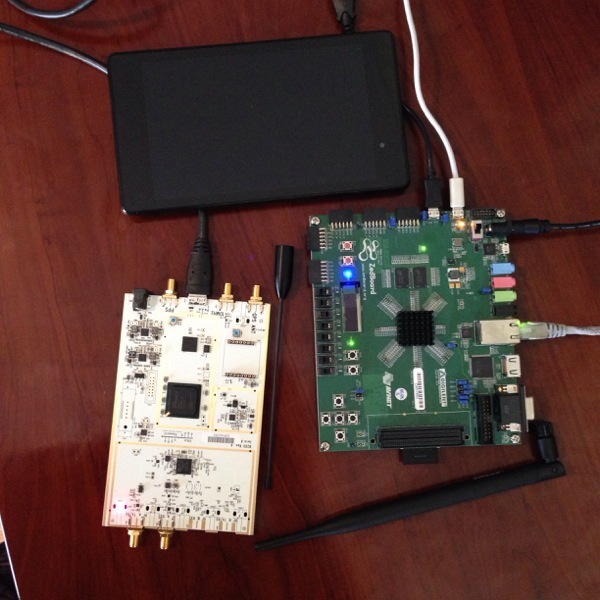 First, I wanted to be able to use a bus-powered Ettus Research USRP with and Android device. And second, I wanted the process documented from the start of building the dependencies to the end of a working (if overly simple) app. Both of those are done. Hopefully, we will continue to evolve the process to make setup and building apps easier in the future. The next step is walking through and providing the annoying boilerplate stuff for hardware access so you can start using USRPs and RTL-SDRs with your devices. But for right now, I want to make sure people who are excited about this stuff have a way to get in and start playing. So where do we stand with our GNU Radio support on Android? some complex support in previous versions is lacking in the ndk; we think we can get around it, just not out-of-the-box. We held our latest GNU Radio Hackfest at Ettus Research last week, and it was one of our most successful yet. It was also our largest gathering of one of these week-long events with something like 25 people at the most (plus or minus since a few were Ettus employees so had to come and go as they could). We had a huge amount of code worked on during the week with contributions from all over the field to make the project better. We fixed a number of bugs and issues that we've been meaning to deal with for a while, and we saw a good amount of other advances to the project happen. We haven't updated the hackfest wiki page yet with our projects, but you can certainly look forward to a lot of the results and features in the next release next week. This blog has been rather silent lately, but that's not because there's not enough to talk about in the GNU Radio world. In fact, there's simply been too much! We've been too busy with events, adding new features, improving old features, and adding new website info that I keep forgetting to update here. First, you can see for yourself the things that have been going on with the GNU Radio Project at the Events page. We just had hackfest at TU Delft that went quite well followed by another successful SDR Dev Room at FOSDEM. A Couple of the videos for that event are already online. A hackfest hosted by Ettus Research. A GNU Radio Hacking Workshop before NEWSDR (details to come). A FOSS and GNU Radio session at the Wireless@VT Symposium. SRIF 2015 with Mobicom (details to come). GRCon15 (we're very close to announcing a date and location). And fred harris and I are teaching another SDR class with the UCLA Extension program. We have also announced our plans for the 3.7.7 release of GNU Radio, which will now include VOLK as a separate library. And the GNU Radio community has been working hard on improving our websites. We are near to a release of our new CGRAN website, which now ties in nicely with PyBOMBS and will help us keep up-to-date with everything better. And we are working on a new front page for gnuradio.org. You know how you've hated being dumped into that Redmine wiki page? Well, that will still hang around as the developer's portal, but we want our main page to be more user friendly and to address the GNU Radio project as a whole, including GRCon and other events and where to find users and use cases of GNU Radio. Along with all of this, we've been working on a number of features. I'll spend more time on each of these later, but wanted to get the word out there. Support for GNU Radio applications on Android. I'm calling this an alpha release since there's still lots to do to make things work smoothly here. Reviving ControlPort functionality by using the Apache Thrift project. We're close to having this merged into master, but the branch is up on my github page. Providing improved packet-based and burst digital signals. Again, a work-in-progress with the branch up on my github page. Adding sample rate and timing info on a per-item basis in a flowgraph. This will allow a block to ask for the exact time stamp of any item, and it provides a global understanding of the sample rate of each block. The code on my public branch works, but I have a better idea how to handle things when sample rates change during runtime. Improving our QA testing and continuous integration services. I've been rolling out a Jenkins server in my office (for now) that manages a handful of different nodes for different purposes. I have a box with the minimum dependencies we require for GNU Radio to make sure we're not moving past them as well as testing on various other things like OS X and 64/32-bit installs. And I even have a system testing our embedded SDK cross-compiler with on-board testing of the QA to see what breaks there. This will help ease my mind of missing something or overlooking some problems. I'll get weekly reports but can also kick off these tests whenever we need to get a state of the project. I think that wraps up the main points of the project that we're working on. I'll update again with details of some of these projects when they've rolled out more fully, especially on the Android, ControlPort, the website, and GRCon items. We've a fantastic lineup for FOSDEM this year, so check it out and plan accordingly. If you follow GNU Radio at all, I'm sure you've heard about our Hackfests. This is where a lot of GNU Radio developers get together for a few days to a week at a time and hack out GNU Radio code. We've found these fantastic ways to improve the project as it gives us time to plan, discuss specific topics, hang out and get to know each other, and code code code! A large amount of the code making up GNU Radio has either come directly from or been inspired by these events. Mostly, we've done these in the US. Ettus Research has been a fantastic host to a number of our hackfests as has Virginia Tech. Just recently, Karlsruhe Institute of Technology hosted a mini hackfest right after the WSR and a full hackfest a few months later. These were our first events held in Europe, and though I personally missed the second one, the post-WSR hackfest was great fun and hugely successful. Following up on this, I wanted to announce and give a pre-emptive thanks to TU Delft in the Netherlands who has agreed to host a hackfest early next year! The plan is to hold the hackfest on TU Delft campus during the last week of January so that we can go straight from Delft to Brussels for FOSDEM that weekend (partly assuming that we have an SDR dev room at FOSDEM again this year). I think having these two events back-to-back is, pardon the Irish, going to be great craic. Well, I mentioned it here a few weeks ago and last week we did it. GNU Radio version 3.7.4 is now out and about. We're really happy with the release for a number of reasons. If you take a look at the release notes, you can see not only a lot of new features we've added on, but also the huge number of contributors. So not only are we feeling really good about the project itself, we have a great community of users that are doing really neat things and helping us improve our code. So a huge hand and big thanks to everyone! I think that the release notes give you the basic idea of what's going on in this version, including ZeroMQ blocks for improved connections between networked flowgraphs over the UDP or TCP sources/sink, better QTGUI handling, and some nice improvements to the GRC interface. Also, as I mentioned in my last post, we now have our new FEC API concept included in gr-fec. Oh, and on that last note, we're very close to having some of the LDPC work done during last summer's GSoC integrated with the FEC API so we can all start to use it in our flowgraphs! The good work is never done, though. We still have so much we can and want to do in this project, and so we've already started laying out some ideas and plans for release 3.7.5. There's some really fun work going on in GRC that I think everyone's going to love, and we're going to be one step closer to defaulting everything to QTGUI (don't worry! WXGUI will have a long lifetime as we migrate over!). We haven't made the full decision, yet, whether to switch the GRC defaults to QTGUI in this next release of wait until 3.7.6. I think we'll make that decision about midway through this release cycle to make sure we have enough time at get the development branch settled on that before the release. Now, no guarantees, but I'm hoping we can get 3.7.5 out in time for GRCon14. That's a bit shorter than our normal time period between versions, but then again, we took a bit of extra time before 3.7.4. I think that it'd be nice going into the conference with a brand new version, plus a lot of features like some of the QTGUI and GRC updates are already done. We'll see what things look like by the end of August if it really makes sense to get 3.7.5 out the door by the conference. Finally, I've said it elsewhere, and probably on other posts on this blog, but just a quick mention of 3.8. We have started collecting some ideas on what we're looking for with 3.8, but we haven't made any substantial efforts on it, yet. We're going to stick with 3.7 for a while longer because we feel like we're able to get a lot of work done with this API version without having to move on. In 3.8 we plan on updating our dependency list so we can be a little more free with features from our dependency libraries, and it'll help us fix a few holes we have in the runtime API that's causing some bugs that we've been tracking. But there's nothing really pushing us to a new API, yet, unlike our previous few API releases where we had some big changes. Instead, all of our big changes are all coming in our "minor" releases. But the only thing minor about it is our version naming scheme! It's been a while since I've provided an update. Lots of travel, both work and otherwise, has kept me from letting everyone know what's been going on in GNU Radio. So let me see if I can start to fix that. I think that our most interesting and fun development was the success of the ISEE-3 reboot team, including our own Balint Seeber (ok, so he's technically with Ettus, but for all of his work with GNU Radio, I'll claim him; at least partially) and John Malsbury. This was an incredibly cool and successful project, and Balint, John, and the rest of the reboot team have done and continue to do an amazing job. I'm not going to try and poorly rehash the work here. But there's been plenty of articles written on the effort and the links provided above here will give you a much better review of what happened and how. In other news, we're close to releasing GNU Radio 3.7.4. I was really happy with our 3.7.3 release a few months ago, and this next release continues to strengthen the project. We have a lot more support and have debugged a few issues with the message passing infrastructure. I see the use of the message passing system as a growing trend in GNU Radio, especially for control and updating parameters of blocks. Another development is a massive update and improvement to gr-atsc. While the original work here was great, it was based on GNU Radio ideas and capabilities from probably 10 years ago or so. Andrew Davis and Johnathan Corgan have done a wonderful job bringing this up to date and improving its speed and stability. This is part of a trend that we're working on (hopefully in the next version release) for more support of other digital TV standards, both transmitter and receiver code. Keep an eye out for gr-dtv in the near future. A huge part of my work recently has been in the integration, development, documentation, and building examples for our new FEC API that is now a part of gr-fec. Historically, GNU Radio hasn't done a very good job with managing or allowing use of forward error correction (FEC) techniques. It's a difficult problem to solve to allow us to easily integrate different types of FECs in transmitters and receivers, either for streaming or packet-based communication links. Each FEC has different properties and conditions for use in the different types of comms links, and they can have different input/output data types that they are built to work with. The new FEC API that's been introduced allows us to handle these situations more seamlessly within a GNU Radio flowgraph. The new gr-fec includes FEC encoders and decoders for a convolutional code (K=7, Rate=1/2, polynomials=[79, 109]) that has been highly optimized with SIMD (through VOLK), a repetition code that simply repeats each bit N times, and a dummy code that actually does no coding but provides a simple mechanism to use and study the API. We are also providing different blocks, called “deployments” in the FEC API, that allow us to make use of these encoders/decoders in streaming, tagged stream, and PDU message-passing flowgraphs. I was able to use the convolutional code FEC encoder and decoder in the gr-mac project for full network communications between multiple computers. This work can be found in the “fec_gmsk” branch of my fork of gr-mac. The GNU Radio manual covers the API and deployments in a fair amount of depth. Obviously, you can always build the docs yourself with GNU Radio, but the main manual page on gnuradio.org will be updated to include this when 3.7.4 is released. Likewise, there are examples for the use of the codes and deployments that are distributed and installed with GNU Radio. So that's just a brief review of what we've been up to the past few months. There are plenty of little fixes, tweaks, and additions that we've been making to the code base in this time that I've left out. But I'm really pleased with the progress and rate of progress we've been making lately. Lots of new, good stuff to help us fill a few gaps in capabilities we've had. I am happy and proud to announce that the agenda for GNU Radio Conference 2014 has been posted. We received an variety of great, high-quality proposals on topics ranging from wireless security to satellite communications and networking. Tom Rondeau and Michael Dickens spent a great deal of time sorting through the presentations and assembling an agenda that is packed full of interesting and educational content. While some minor details may change, you can find an up-to-date agenda at the following link. If you are a presenter and need to modify your entry, please contact Michael Dickens to do so. On another note its worth mentioning that we have been keeping a pulse on registration. Based on the current run rate, we believe that this is going to be the largest GNU Radio conference, by far. With the conference agenda assembled and great forward momentum, we would like to ask this awesome community to help us promote this event. GRCon14 is on the verge of becoming one of the largest and most influential events with a focus on SDR and wireless implementation. With a community-driven effort, we could really put ourselves on the map this year and generate even more excitement with potential users and developers. Whether you simply remind your fellow GNU Radio developer, or invite someone new to join us for this event, we think your enthusiasm for the event is the thing that will make the difference. We are really pleased to announce GRCon14. We've selected the location (a beautiful building right in the center of downtown DC) and time (Sept. 16 - 18). The call for presentations is already up, and we already have a submission! With John Malsbury leading the effort and help from Michael Dickens, this is definitely shaping up to be a fantastic conference. Keep a look-out for news because we'll be opening up registration very soon. Just on my way to FOSDEM (fosdem.org). I've never been, and I'm really looking forward to it, especially with the software radio dev room we have on Sunday. We've been working hard on a lot of stuff in GNU Radio, as usual, and I hope to be able to show off some of this over the weekend. Here's some of the gear I'm bringing with me to hack on while we're there. Boarded my flight. Be seeing some of you in Brussels! GNU Radio 3.7.2! New Logo! Anything else?! If you don't regularly visit gnuradio.org or this site, you might just now be noticing something new about things. Just yesterday, we updated our webpages and announced the new GNU Radio project's logo! I want to thank Johnathan Corgan, Ben Hilburn, Martin Braun, and John Malsbury for acting as steering commity to provide feedback for the different logo designs we received. We used the website 99designs to host the design competition, and the process went smoothly with an easy-to-use website and responsive and helpful staff. We received in the end 419 submissions for designs from 98 designers, which was well more than we envisioned and made the selection incredibly difficult. Another exciting development in the GNU Radio project is that we recently relased version 3.7.2 of the software. Although it's a minor version number change, take a look at the release notes to see how much we actually put into this release. I'm personally excited about the new modifications to the gr-qtgui time sinks that display stream tags and triggering support. New features that I find myself not being able to do without once I started using them. But I'll try to keep this short. We have tons going on in the GNU Radio ecosystem right now that's all really exciting. One thing is that I feel personally "caught up" with the code. We have a couple of big ticket items in the early stages of development and a handful of bugs that we still need to addres, but the core of the software is pretty solid for the time being. What this means is that it's now time to really work on the other aspects of the project. Mostly, this has to do with developing the GNU Radio Working Groups. The WGs have already been an incredible gift to the project. We're seeing a great amount of participation and interest with these groups, and that doesn't look like it's going to stop. And we've already had significant contributions on the Community Development WG such as enhancements to GRC. And yesterday, we had a Google Hangout to discuss issues of improving the website, documentation, and FAQ pages to help new users get up to speed faster. Thanks to everyone for participating and helping out! Last week was GNU Radio's third annual conference, GRCon13. I've made some personal comments over on my blog page, but I wanted to say thank you again to everyone who came and made this a great conference. I'd like to thank John Malsbury for his significant efforts this year to make it a great conference and Johnathan Corgan for his input throughout the year. And once again, a huge thanks to our sponsors. Almost all of the presentations are available. You can see the agenda page to quickly link to specific talks or head straight to the presentations page to download them. There are also links there to find the wiki pages for the GNU Radio Working Group discussions and work done at the Hackfest. This year renewed my belief that we're working in the right direction, and I'm now even more excited for what we can do with GNU Radio this year. And of course, we'll catch up on all of this at next years GRCon14!